Addis Abeba, September 14/2018 – Ethiopians have obviously a manifest difficulty in understanding rationally both the rise of Dr. Abiy Ahmed to premiership and his implementation of far-reaching changes. Here is a man who comes from the ranks of the coalition of political parties known as the EPRDF and whose defining feature is that it is filled mostly with members who, on top of being incompetent and greedy, are also toxic to Ethiopian unity. This political amalgam ruled Ethiopia for 27 years, mainly thanks to its dominant party, the TPLF. The latter used the other parties as junior partners to assert its political and economic hegemony over the whole country by means of an oppressive system of government coupled with a cynical policy of divide and rule. One should admit that everything conspires to push Ethiopians in the direction of messianism. The rise of Abiy causes first disbelief and then the sense of an extraordinary occurrence precisely because he emerged from a rotten party crippled by all sorts of infirmities and horrific misdeeds. Had a robust reformist leader risen from the ranks of the opposition, nothing would have been out of the ordinary. People would simply recognize what they had expected. That a savior came from a ruling party on the verge of a free fall is what is disconcerted and difficult to analyze in rational terms. And to crown it all, while the rise of an opposition leader to power would have inevitably caused resistance and violent responses on the part of the outgoing ruling elite, the fact that the reform movement came from inside the ruling party gave the changes a legal and peaceful turn. Some such outcome looks like an arranged, planned occurrence denoting a divine intervention. In vain does one struggle to find a historical parallel: whether we think of Mandela or Gandhi, all came from parties opposing existing regimes, not from the party in power and, what is more, from a detested and disabled party. Doubtless, this Ethiopian infatuation with Abiy has a positive side. To the extent that it gives confidence to Ethiopians and mobilizes their energy, it facilitates the implementation of reforms. Nothing is more promising than to see a people lifted by a sudden enthusiasm after decades of demoralization and hopelessness. In a sense, this popular excitement reminds the time when the imperial regime came to an end in 1974 amid promises of a bright and socialist future. Moreover, this uplifting enthusiasm discourages and weakens all those who oppose the reforms, whatever their reasons may be. In seeing the fervor that Abiy generates, enemies of reforms are forced to think twice before attempting to reverse them, as such an attempt will unleash a flood of protests with unpredictable consequences. Let it be added that the depiction of Abiy in messianic terms should not come as a surprise, as it is but the manner many Ethiopians revert to the resources of their traditional culture in the face of unexpected events. Indeed, one of the basic tenets of the culture is the deep belief, as stipulated in the founding book of Ethiopian polity, namely, the Kibre Negest, that Ethiopia is God’s favored nation, a belief upheld by the biblical injunction that “Ethiopia shall soon stretch out her hands unto God.” Ethiopia’s long and tumultuous history is replete with divine interventions in the form of saviors to protect it from adversities, mostly set off by powerful would-be invaders (to know more about Ethiopia’s messianic understanding of its history, refer to my book, Survival and Modernization: Ethiopia’s Enigmatic Present). In that book I argue that one of the reasons for the exceptional long survival of Ethiopian polity is the messianization of its history. Unfortunately, it is also true that messianization is little compatible with the requirements of modernization. I am not saying that Ethiopians should turn their back on messianization; rather, they should understand its frictions with modernity and redefine it in such a way that it supports the modernization effort instead of opposing it. Evidently, I have in mind Ethiopia’s propensity to produce promising leaders that turn autocratic, if not frankly dictatorial. What else is the common denominator between Haile Selassie, Mengistu Haile Mariam, and Meles Zenawi but the obsession with absolute power, an obsession that ruined the establishment of even a modicum of democratic and open society? Granted that Abiy’s willingness to reform Ethiopian society and enhance its unity is indisputably serious and far-reaching, the fact remains that messianization carries the great danger of leading to a personality cult that can easily jeopardize everything. No matter the moral integrity of the person, messianization institutes unaccountable power and, as is often said, “power corrupts and absolute power corrupts absolutely.” It is imperative that Ethiopians come up with a secular explanation before their inability to comprehend rationally drives them to surrender their right to criticize and demand accountability. In justifying power by instances that are, by definition, beyond their control, Ethiopians do no more than succumb to irrationality, the end result of which is the inability to work toward a system of power that is accountable to the citizens. How, then, is one to understand rationally Abiy’s rise to premiership and his forceful will to reform and promote national unity. The best approach is the one that tries to connect Abiy’s personal qualities in terms of moral rectitude and visionary leadership to the events and opportunities generated by social movements. The idea is that the encounter between the social movements and the personal qualities of the leader explains the change that is taking place. When it comes to the role of “great men” in history, two theories usually compete. The one maintains that the exceptional charisma, vision, and determination of individuals seduce and move societies. The other, for instance the Marxist theory, counter-argues by claiming that great individuals are just products of social struggles. People follow such individuals because they embody what they deeply want. The problem with the Marxist approach is that it explains everything except why we still speak of “great” individuals: unless the individual imparts to social movements a direction that they could not otherwise adopt, the qualification of “great” seems overrated, to say the least. As to the first kind of explanation, its obvious weakness is its inability to give a rational account: a mysterious force seems to be the reason why the leader has such a mobilizing impact on the people. The explanation overlooks that the extraordinary qualities of the individual would have remained unnoticed or ineffective without the opportunities offered by the social movements. In the case of Abiy, his rise is certainly unthinkable without the social protests and struggles waged by the people––with many paying with their lives––in Oromia, Amhara, and other regions of Ethiopia. These heroic struggles had two major effects. (1) They showed the inability of the regime to deal with the serious problems that the country is facing, many of these problems being caused by the use of dictatorial methods to serve narrow interests. This inability, in turn, prepared the ground for the surge of recalcitrant groups within the ruling party. (2) While the need for reforms increasingly became obvious for most members of the ruling party, the thinking of the dominant partner within the coalition, the TPLF, was just to patch up some aspects of the system so as to get rid of glaring defects, such as corruption and mismanagement. This misreckoning of the extent of frustration in the country at large and in the party coalition by the dominant partner springs from the refusal to accept any assessment of the situation that would undermine its hegemonic position within the ruling party. This refusal led to a misperception of the boiling rebellion in the coalition, with the consequence that the TPLF lowered its guard and allowed the election of a new prime minister believing that whoever is elected would just be another puppet in the manner of the outgoing prime minister. This oversight caused by overconfidence created the opportunity for the unexpected to sneak in, so to speak. 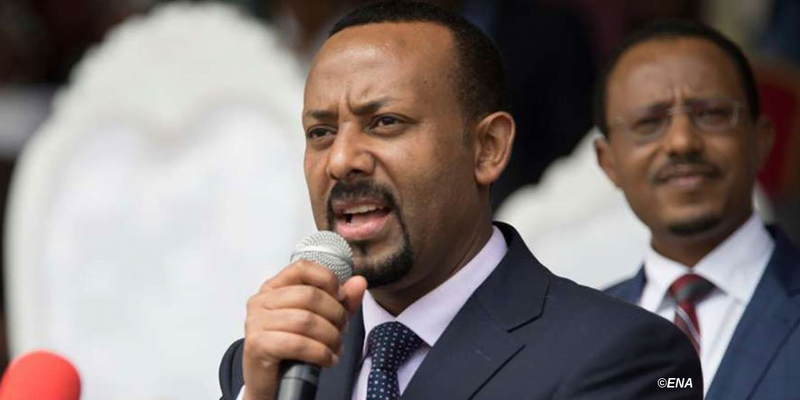 Though it is true to say that most members of the coalition in a position of leadership understood the need for some changes, what differentiates Abiy and his followers within the OPDO is the clear perception that the derailment of the coalition toward the use of dictatorial methods to uphold narrow interests has its root in the undermining of national unity. The system is not working as it is supposed to work because it does not operate in the framework of a unified whole. Once the cementing sentiment and the socio-political bonds of national unity are weakened in favor of a mere collection of nations, what else can keep together this assemblage but the hegemonic position of one of its units? In effect, when the TPLF’s decided to adopt a policy designed to undermine national unity, just for the purpose of countering “Amhara dominance” in the generation of Ethiopian nationhood, it created a situation where the ethnic units, henceforth baptized nations, had no reason to stick together. In so doing, the TPLF thought it will rise to the status of being the sole force upholding the unity of the country, but missed the fact that this hegemonic role will in due time cause resentment within the coalition, especially from the two partners representing respectively the largest number of people, namely, the OPDO and the ANDM. In other words, to exercise its political and economic ascendancy over the country, the TPLF as representative of a minority population had to fragment the country along ethnic lines so as to deploy the ruling stratagem of divide and rule, but his same stratagem was bound to backfire as soon as popular discontents showed that it can no longer rule by using the same method. As one can see, the crisis in Ethiopia tallied with the requirements of a revolutionary situation, as laid down by Lenin. The continuous popular resistance and uprisings indicated a situation where “the lower classes do not want to live in the old way” and the divisions and conflicts within the EPRDF denoted a turning point announcing that “the upper classes cannot carry on in the old way.” Yet, the Ethiopian situation did not evolve into a revolutionary uprising seeking the overthrow of the government. Instead, a reformist wing led by Abiy and his followers managed to seize the control of the state. The explanation for this deviation is not hard to find: as we saw, the split within the ruling party was not only over the appropriate response to the popular demands; it was also about the unequal status of the junior parties in the coalition, notably of those representing the Oromo and Amhara regions whose populations and resources exceed by far those represented by the dominant party. Their status as junior partners clashed with their actual economic and political importance, so much so that there emerged a coincidence between the popular demand for a democratic system of government and the demand of democratic representation within the coalition. This coincidence explains the special bond that developed between OPDO and ANDM, which bond was instrumental in the election of Abiy as Prime Minster. It also clarifies why the reformism of Abiy and his followers had to go beyond a mere cosmetic adjustment of the existing system, as the restoration of the rightful places of their party required nothing less than the dismantling of the hegemonic position of the TPLF and of its methods of ruling. Their reformism could not be a mere patching up as it required a democratic reversal of positions within the ruling coalition. In short, what accounts for the far-going reformism of Abiy and his followers is that popular uprisings and dissents within the ruling party coalition converged on the same demand for solutions based on democratic principles. There is more. The democratic rectification of alignment in the coalition no longer needed the stratagem, vital for a party representing a minority population, of divide and rule. Instead, it clearly displayed the link binding national unity and democracy. As representative of a minority ethnic group, the TPLF took the decision of undermining national unity and replacing by its own hegemonic rule. However, hegemony is incompatible with democracy, both in the society at large and in the coalition of ethnic parties. Short of secession, getting read of hegemony entails nothing less than the restoration of national unity as the very bond uniting equal citizens and ethnic groups. Paradoxical as it may sound, TPLF’s reckless policy of undercutting national unity so as to institute its own supremacy compelled those members in the ethnic parties who were not warming up to a secessionist solution to go unequivocally for national unity. Where national unity is restored and hailed, you dispose of hegemonic rule, and so put in place the proper conditions for a democratic government. This profound tie between democracy and national unity defines Abiy’s very vision, which he attained all the more easily as it rhymes with his humanitarian and open personality. The post Analysis: The Rise of Abiy Ahmed and the Janus-Faced Nature of “Abiymania” appeared first on Addis Standard.